Melt butter in a large nonstick skillet over medium heat. Add the kale and a pinch of salt and cook, covered, until wilted down, stirring often, about 5 minutes. Transfer to a plate and set aside. Wipe out the skillet, increase the heat to medium-high. Add 2 t. oil to the pan, add the onions and cook, stirring occasionally until softened and slightly browned, about 5 minutes. Add the garlic and thyme and cook until fragrant about a minute. Add the onion mixture to the plate with the kale. Add the remaining oil to the skillet. When the oil is shimmering, add the potatoes. Season with salt & pepper. Cook, with out stirring, until the potatoes are golden-brown on the underside, about 5 minutes. Stir in the corned beef and the cooked onions and kale. Using the back of a spatula press down on the hash to compact it, drizzle the cream evenly over the hash and cook, undisturbed for 5 minutes. Turn the hash (a spatula full at a time) and press down again and cook for another 5 minutes, undisturbed. Repeat this one more time. Hash should be pretty well browned at this point. 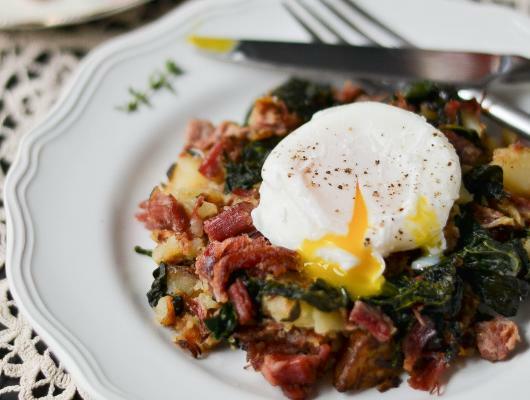 Serve hash topped with eggs. 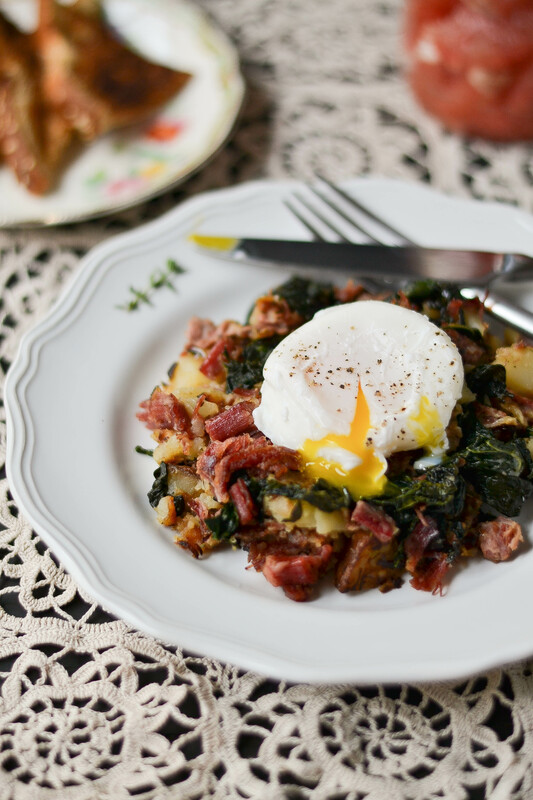 Corned beef leftovers get one last hurrah and a healthy bump up in this easy and delicious traditional style hash with the addition of kale.